I was a little nervous about coming to Thailand less than a month after their King, Bhumibol Adulyadej died. Based on a lot of what I had read, much of the country’s activities would be reduced or eliminated during the extended year-long period of mourning, especially during the first month. But even more than that, there was the potential for civil and political unrest as power changed hands for the first time in over 70 years. I thought the idea of a year-long mourning was a cultural formality until I got here and realized that these people adored the king. Many of them grew up with him and saw him as a father or grandfatherly figure. He adorns every single one of their bills. So when he died, many people were as devastated as one would be if they lost a parent. It’s out of legitimate devotion that people are mourning in such a way, which is a beautiful thing that is absent in many cultures, including mine. As a way to pay their respects, Thai people from all over have descended on Bangkok to say their final farewell at the Grand Palace, where the King’s remains will be housed until his cremation a year from now. So hundreds of thousands of people wait in line every day outside the palace to be let in in small groups at a time. Sanam Luang, the adjacent park, has become a waiting area where volunteers hand out free food and drink to visitors. Many people give out fans and black ribbons. It’s a wonderful and kind thing to do for the people by the people. 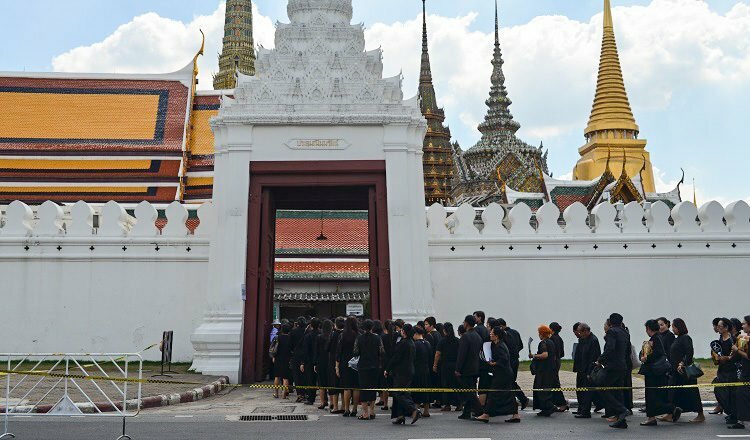 Mourners can also be seen throughout the city at temples where they are praying for the King. With the help of a friendly local, we also lit some incense in his honor. At first, we were a little hesitant about visiting the Palace, because it felt like we were intruding on something very somber and very personal. But as organizers saw us mill around, they gave us instructions on how to go through the security check and show ID. When we got near the grounds, we noticed there was a separate entrance for Thai people and non-Thai visitors. Despite the massive crowds, everything was handled in a very orderly way. And the Thai people were happy to have us be part of it. Volunteers of all ages handed us drinks and offered food as we walked past. 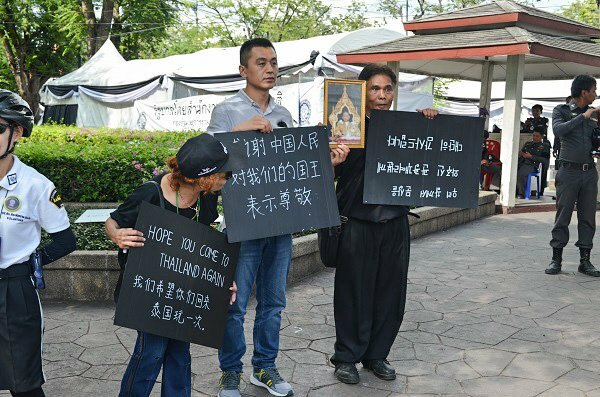 A couple of people held up signs thanking foreigners for respecting their King. People seem to be genuinely appreciative that we are wearing black along with them, even though we were under the impression that it was almost mandatory. Because of the mourning period, a lot of events and activities throughout the country have been scaled back. We found that as a tourist, you can still find plenty to do. 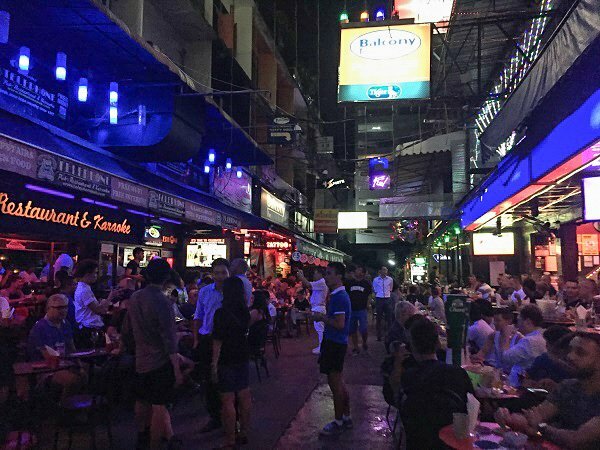 Clubs and bars are still open, especially in the popular tourist areas of Bangkok like Silom Road and Khao San Road. There is no shortage of alcohol or activity day or night. But frankly, I didn’t come here to be an inconvenience to people who are in mourning, so we’ve kept it low key over the past couple of days. Silom Road on a Saturday night will probably be considerably less busy than usual in the coming months. The coming days were scheduled to be especially festive for the Loy Krathong and Yi Peng Lantern Festival, which is precisely the reason why I wanted to come to Thailand during this time of year. Though festivities will still go on, especially in Chiang Mai, many of the events have been cancelled or reduced in scale. In Chiang Mai, there will only be one parade instead of several and the usual beauty pageants and concerts will not be taking place. Thankfully, the famous lantern release will still take place in honor of the King. The full-moon party on Koh Phangan is also scheduled to go on, but without the usual wild atmosphere that the event is famous for. The island still anticipates a lot of tourism to ring in the new year in December. As the year passes, things will slowly return to normal. Even now at the height of the mourning period, the King’s death has not been detrimental at all. In fact, because of his death, museums and historical parks are free throughout Thailand until January 31, 2017. It’s lovely that sadness brings out such kindness in the Thai people.